Hulu’s new app for the Apple Watch turns the wearable device into a remote control for users to play, pause and rewind TV shows by simply tapping on their wrists. The app connects to Apple TV, Chromecast, Xbox One, the PS3 and PS4. Apple TV users will need to launch a Hulu stream on their iPhones, whereas users of other platforms can connect to any existing device already streaming Hulu. The launch is Hulu’s way of testing how a smartwatch app might become part of a consumer’s mobile experience. Apple previously experimented with using the Apple Watch as a remote control through a built-in music app that allows users to manage their playlists and songs from the Watch screen. However, it is unclear whether Apple Watch users will be receptive to using their smartwatch as remotes for Hulu, as opposed to simply using their device remote or Hulu’s iPhone app. Hulu likely views the Apple Watch experimentation as a mere test to see if its consumers would actually use it, as according to TechCrunch, the app was developed by an intern. 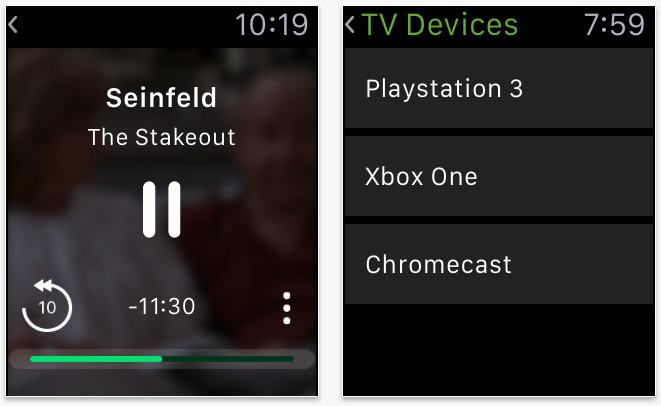 “The Hulu application on the Apple Watch is the perfect opportunity to explore the Apple Watch OS and experiment with ways to integrate the Hulu experience into the popularity of wearable platforms,” notes the Hulu blog.